The 190G W features a 173-hp (129-kW) diesel engine that meets Final Tier IV emission regulations without aftertreatment devices. The wheeled model boasts an operating weight between 43,431 and 45,300 lbs. (19,700 to 20,500 kg). Ideal for municipalities and work in heavily populated centers across North America, the updated John Deere 190G W excavator provides customers with a “Swiss army knife” for clearing ditches, repairing sewers or potholes, loading trucks or moving Jersey barriers. The 190G W features a 173-hp (129-kW) diesel engine that meets Final Tier IV emission regulations without aftertreatment devices. A lightweight, split-type hood provides wide-open access to the engine from the front, and same-side filters and water separator at ground level simplify maintenance. The wheeled model boasts an operating weight between 43,431 and 45,300 lbs. (19,700 to 20,500 kg). The 190G W possesses a short wheelbase to slip into close quarters with ease. For close-up work, customers can opt for a two-piece boom. The excavator can quickly move between job sites with a top speed of 21.7 mph (35 kmh), and rubber tires won't tear up concrete or asphalt. A spacious and comfortable cab comes equipped with an easy-to-navigate enhanced LCD monitor that lets the operator easily dial in a wealth of machine information and functionality. 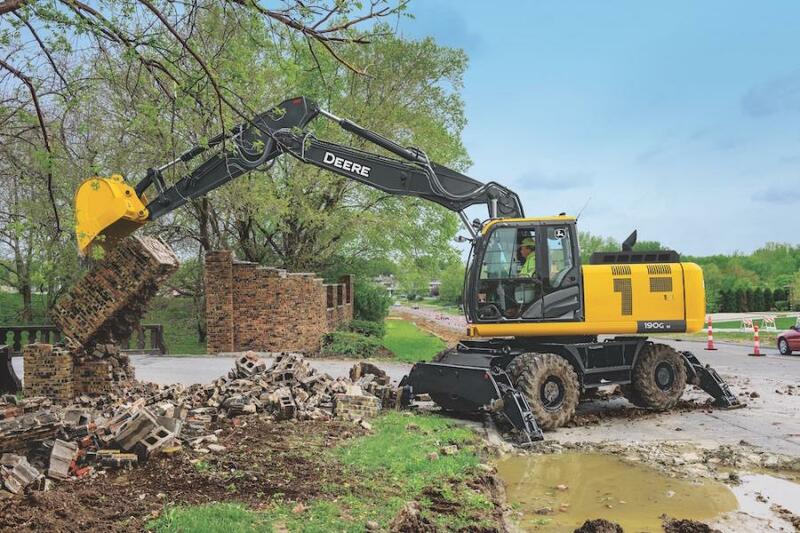 Fleet managers looking to get the most out of their 190G W excavator can rely on their John Deere dealers to provide Ultimate Uptime, featuring John Deere WorkSight. With Ultimate Uptime, owners receive predelivery and follow-up inspections that include five years of JDLink telematics, machine health prognostics, remote diagnostics, programming capabilities and the ability to add dealer-provided uptime solutions to a customized package.